The new month brings with it a wide selection of new products from VioVet. Our range of Flexi dog leads has been expanded with some high quality new products added. For cat owners we have a new highly absorbent cat litter made from recycled paper. 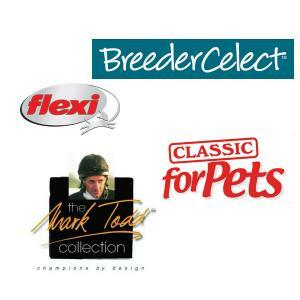 For our equine customers we have hugely expanded our Mark Todd range with products for both your horse and you. For the small pet owner we have a new see-saw toy from Classic Pet Products for them to enjoy. Flexi are the market leader of retractable leads in almost 90 countries. This company from Germany was founded in 1972 and still produces high quality retractable dog leads based on the original prototype which was such a success. The popularity of Flexi dog leads means that VioVet now supplies new selections, which is excellent news for our canine customers. The Neon Reflect lead allows you to be easily seen when in low light while the Giant Professional is suitable for very large dogs. Whichever you choose, be prepared to be impressed. BreederCelect is a new cat litter this month which is made from 99% recycled paper with no additives or chemicals at all. The biodegradable litter is highly absorbent and does an excellent job at controlling odours. It is also very economical so you need to buy a bag less often than with many other litters. Available in various bag sizes and each comes with a handle and pourable spout so it doesn't go all over the floor when trying to fill the tray. The Mark Todd Collection has been producing high quality equine products for a few years now, and their successful range is ever-growing. Many of our equine customers have already taken advantage of these new ranges which include products for your horse, and equine clothing too. Our new Mark Todd saddlery options include the Patent Piped Bridle, Patent Leather Headcollar, Performance Leather & Nylon Lead Rope, while the clothing collection has been expanded with such products as the Flat Front Euro Seat Performance Breeches for men and the Contender Competition Breeches for ladies. Classic for Pets have produced some excellent products for small animals which have always impressed our customers. That is why the small animal choice this month is the new Classic See Saw. It is ideal for gerbils, hamsters and mice and allows your pet to play, as well as having a hiding place that you can see through so you always know where they are.